Use your iPod Classic, Video, or 2/3 generation nano as a high-quality audio recorder. 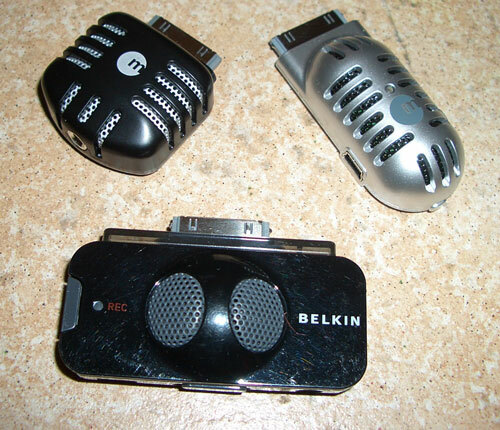 Each of these three microphones works fine and as promised. Features differ slightly, as does the sound quality (timbre) of their recording. The $40 MacAlly iVoiceIII is best value if you only need to record. The other two products have additional features. Be aware your iPod batteries are powering the microphone, so battery drain is severe compared to iPod audio playback. I consider these mics to be essential gear for live music and voice recording, and recommend them highly. The $50 iVoicePro has the most features, with a slight treble bias compared to the other two mics. Quoting from company puffy prose: “Don’t let the miniature size of these speakers fool you. The sound quality of these babies is amazing.” That’s correct. When small, versatile, and affordable are at the top of your speaker wish list, look no further than Aerielle’s new i2i portables. They are very small, and are louder and clearer than you would expect. 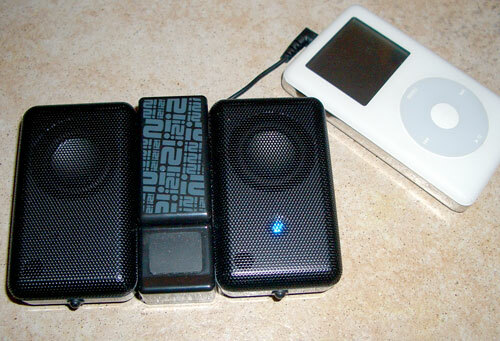 Using battery power, you can listen to music for 6 – 10 hours. An optional AC power unit is available. The cable that connects speakers to iPod is ridiculously short, so pick up an audio extension cable from Radio Shack or a similar source. I’ve been using i2i Portable Speakers in the car, with success, for podcast and some music playback, even with windows rolled down. Volume and equalizer settings are taken from your music source, since there is only an on/off switch on the back of the speakers. A blue light glows when the speakers are on, and this light could be a lot larger or brighter. Equating sound per ounce or unit of currency, this is a remarkable speaker system. Simplifi is a “too good to be true” desktop accessory. You can clear your clutter by dumping your most common external devices, and replace them all with one master stroke. Charge and dock an iPod/iPhone, mount nearly every common camera card, and connect or power a pair of USB items, all from one stylish, compact, utility brick. I just took Simplifi on an out of town trip, and I used every slot several times over the weekend. You want to borrow mine and test it? No dice! Suggestion to Griffin Technology: space the two USB ports farther apart. Some USB connectors are too chubby to fit that close together. Otherwise this is an essential wife-pleaser, for all you gadget guys who have a zillion different hubs and docks messing up the house. How did I live so long without this charger? It works with every Mac battery my family, clients, and students have, so I can be a hero wherever I go. 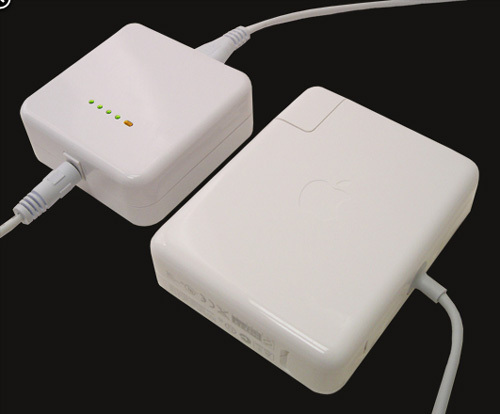 Being able to charge a PowerBook, iBook, or MacBook/Pro on the go from a power outlet is extremely useful, especially when traveling. Knowing your batteries will always be charged is worth much more than the price of this one-trick addition to your gadget bag. 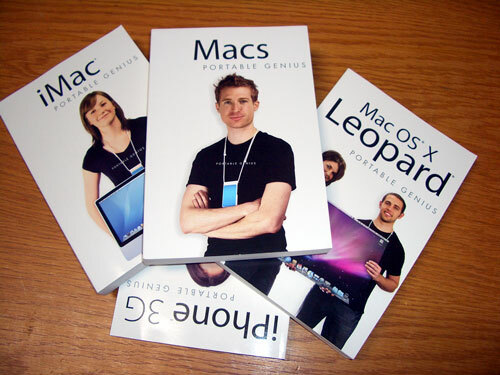 The FastMac web site explains which of the two models is appropriate for your Mac laptop. Which third-party battery is best? After using and testing and charging and discharging PowerBook and iBook batteries from different manufacturers for six months, I am confident these $80 batteries from FastMac are top performers at a competitive price. With replacement batteries available for nearly every portable Apple computer that can possibly still be running, you can power your Pismo or top up your TiBook for more hours and fewer dollars than you ever thought possible. Strong recommendation. Here is the gift that keeps on giving years and decades into the future — the gift of playing live music. With one of the best web sites I’ve ever seen, and the very best instrumental lessons I’ve ever experienced, iVideosongs will keep you strumming, picking, pounding, and tickling your guitar, bass, keyboard, or drums into the wee hours on the morning after the big night, and for ten years after that. 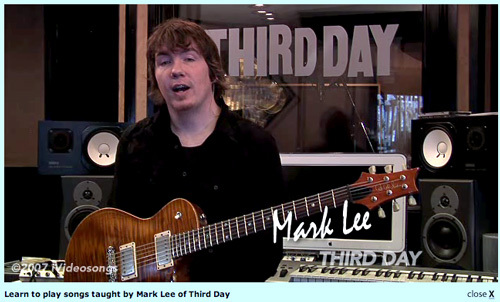 Spend some time sampling the free material and demos at <http://www.ivideosongs.com>, then purchase your high-definition video lessons. You’ll be surprised to meet several celebrity performers as instructors, in addition to the excellent in-house teachers. For the beginner, intermediate, or advanced musicians in your life, iVideosongs are amazing gifts. 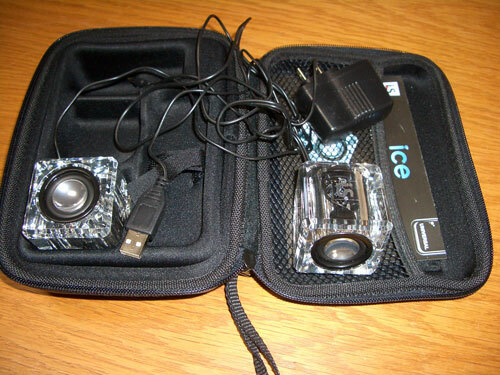 Small speakers don’t get any cooler than Ice from i.Sound. They are tiny, with a surprisingly robust audio. Power them via USB from your computer, or with a clever AC adapter. Cables are a bit short and thin, so treat them with care. All volume and equalizer settings come from the iPod or computer source, meaning you’ll need to test different equalizer tunings until you determine the best one for typical listening situations. Some Macs create static interference when powering Ice via USB. I’m in touch with the company about this, so check back if you encounter the problem. Speakers have an attractive blue glow when in use. An outstanding carrying case is provided. Keep this Ice away from your martini or egg nog. In a corner, playing tunes from your iPod is close enough to the liquid refreshment. Nobody really loves their auto FM transmitter, unless they live far from radio station cluster interference. This versatile model has an easily rechargeable battery, allowing it to be tiny. iTrip Universal is compatible with every audio device that has an 1/8″ (3.5mm) headphone jack, meaning just about every portable player in the world. Frequency stability is the best we’ve seen. It’s a pleasure finally to be able to recommend an FM auto transmitter. Traveling techies need this tiny, tidy kit. 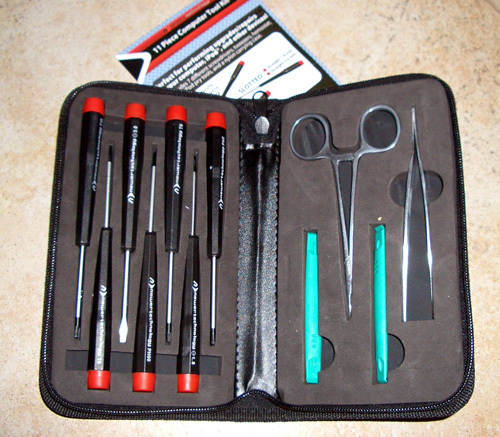 Tucked into a convenient case are most of the tools required for working on and in laptops and small electronic equipment. I mostly use the non-magnetic screwdrivers and tweezers, but the iPod pry tools and torx will come in very handy one day soon. Oh, no! 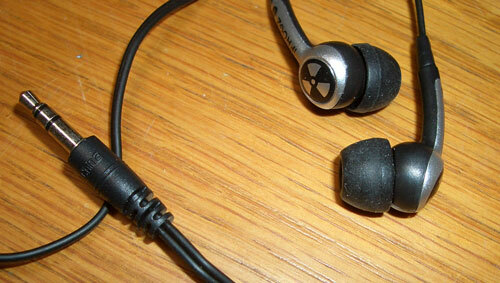 Not ANOTHER set of earbuds. These straight-stem Plugz buds from iFrogz will either be comfortable or they won’t. Either way, for $15, quality of construction is fine, and so is the sound. Rubber tips in three sizes are provided, and different colors are available. For the price, a decent audio spectrum is delivered, with piercing treble that you can modify in your equalizer settings. The sound is very crisp. Not for audiophiles or bass maniacs, but for casual listening, you’re in the groove, or at least in the ear.